For thousands of years prior to European exploration, there were numerous indigenous tribes who inhabited North Carolina. Some spoke Algonquin and others Iroquoian. The Spanish were the first to arrive around 1540 and started settlements in 1567. Soon after the Irish, Scots, English and Germans arrived in numbers. Cotton and tobacco became the money maker crops and a plantation slave system developed around it. North Carolina was overwhelmingly in favor of the American Revolution but underwhelming in its actual support of troops, sending General Washington only 7,900 soldiers. Extricating themselves from the evil of slave holding dominated North Carolina politics and history through much of the 19th century. North Carolina lost nearly 41,000 men in the Civil War on the battlefield and to disease, with almost an equal share to each. Where Is Car Moving Best In North Carolina? Is there another state so incredibly wired with interstate freeways as North Carolina? We don’t think so. There are three metropolitan areas that benefit the most; Charlotte, Greensboro and Raleigh/Durham. Those three places make it easy for our North Carolina car transport quotes calculator to do its magic, and give the user a competitive quote in almost every conceivable direction. Looking at the map, we can see that no less than seven (7) major interstates enter North Carolina: I-26, I-40, I-73, I-74, I-77, I-85 and I-95. Outer belts I-485 and I-540 help Charlotte and Raleigh respectively, which combined means there are plenty of options for an auto transporter to get in and out of North Carolina. 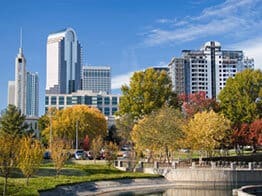 Charlotte is the most famous city and best for North Carolina auto transport. Interstate 77 runs north from South Carolina and straight through it. I-85 is a straight shot from Atlanta, Georgia, the capitol of the South. I-40 is a stones throw as it passes by on its way to Greensboro. So Charlotte is well connected and that is reflected in our auto transport quotes calculator rates. Greensboro enjoys having I-40 run through it on the main east-west highway in America, and of course I-85 is on a direct line to Charlotte and Atlanta beyond. Not stopping there, Interstates I-73 and I-74 join the fray by running in a north-south direction through Greensboro, making it also ideal for auto transport. Raleigh-Durham is farther to the east of Greensboro and connects via I-40 and I-85. Not too far away from Raleigh is I-95, which is the main artery running from Maine to Florida along the Atlantic Seaboard. So if you are shipping a car from those three major metropolitan areas to just about anywhere else in America, you should enjoy good luck using our North Carolina auto transport calculator. Where Might I Have Some Auto Transport Difficulty? At the extremes of North Carolina to the east along the Atlantic Ocean shore communities running from Wilmington to Elizabeth City, and as well in the far western corner near the Smokey Mountains, it can get problematic shipping your car. Think about it, Wilmington is a beautiful town with a nice size population, but it is at the end of the distribution line running east-west. Nobody is passing though because obviously the ocean puts a stop to it. And I-95 is a pretty good haul from Wilmington. North Carolina auto transport carriers will do it, but they want a little extra for the trouble. 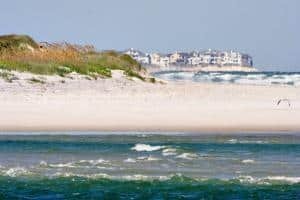 Our North Carolina auto transport quotes calculator adjusts for that, and the same situation exists for all the beach communities running north from Wilmington toward Elizabeth City. Just because it’s beautiful there does not mean it’s easy. On the other side of the state, once you get outside Asheville on I-40, it can get dicey in the auto transport world. The Nantahala National Forest and Great Smokey Mountains are a bucket of cold water on fast auto transport shipments. 1. If in the eastern part of the state, try meeting a driver in either Raleigh or Fayetteville to ship your car. 2. If in the east-central part of North Carolina, try meeting an auto transport driver in Fayetteville, or the greater Raleigh-Durham-Chapel Hill. 3. If in the central part of the state, choose the greater Greensboro-High Point area to meet an auto transport carrier. 4. If in the west-central region of North Carolina, take advantage of Charlotte to get your vehicle on the road faster. 5. If in the far western part of the state, it’s Asheville or bust, and you might wait a little bit even there for an auto transporter. We were the very first North Carolina auto transport company to provide online free shipping quotes without asking for any personal information. Yep – we originated the online car shipping rates calculator. Our quotes and service are among the very best in the industry. Please visit Direct Express Auto Transport to fill out a simple form and get a free car shipping quote. We make it easy to book your vehicle shipment online.